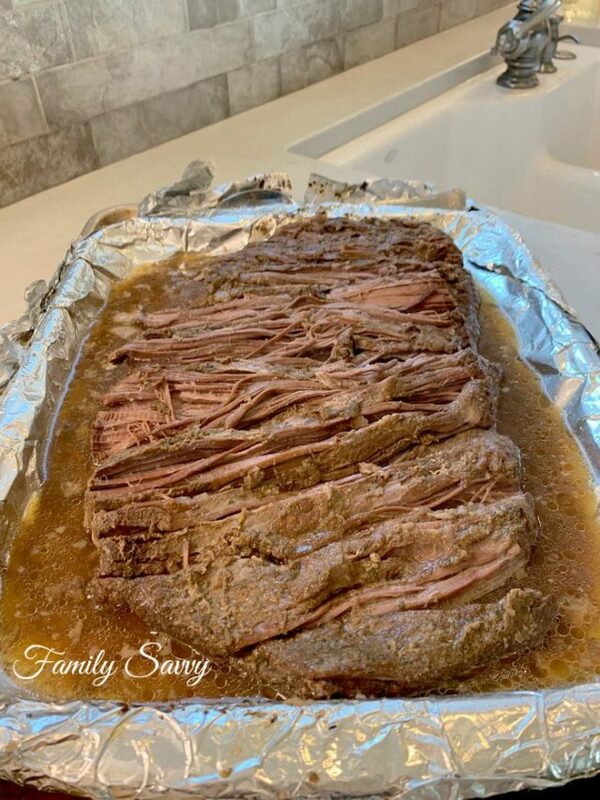 Beef Brisket You Won’t Believe cooks all day in a low oven and yields a savory, smoky & succulent platter of chopped beef that folks will literally devour. I can say with full confidence that this beef brisket you won’t believe is some of the best brisket you’ll ever make or eat. This decades’ old family recipe has been delighting our friends and family for years. When Zane’s family lived in Amarillo, Texas, his mom learned to cook this brisket, as it was “the thing” with most hostesses. Brisket is the “King of roasts” in Amarillo, whereas most of us in the South lean towards pot roasts. If you haven’t ever cooked an Amarillo style oven brisket, you absolutely must. You will be hooked for life. If you’ll note in the photo, this brisket is shredded/pulled/chopped. Many folks think beef brisket has to be sliced, but this one is cooked to the “fall apart tender” stage that is perfect for chopping like BBQ. What type of brisket do you buy? It is very important to buy a flat cut beef brisket NOT corned beef brisket. If you see the word “corned” on the label, this is not the right meat. Costco is my preference; they have lovely briskets at a good price. My briskets are not trimmed. It is super easy to remove the fat from a brisket once it is cooked. The fat layer (cook with it on top) keeps the meat moist during cooking). What size of brisket do you buy? Brisket is something that I usually make for company. It is what I call “small group food.” I usually buy a 6-7 pound brisket when we are aiming to feed 18-20. I usually put another meat alongside this. Sometimes I get a couple of BBQ chickens quartered or chopped for a BBQ buffet (when we have a crowd). 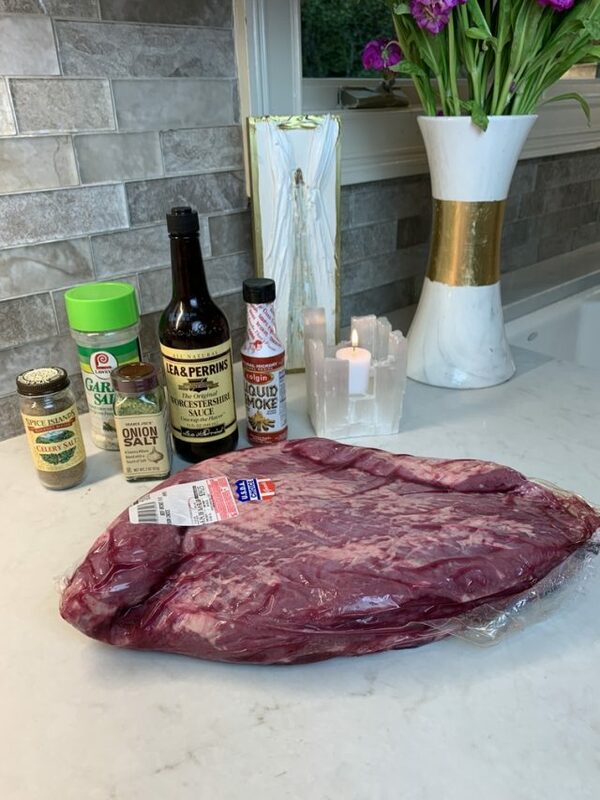 How do you marinade beef brisket for cooking? 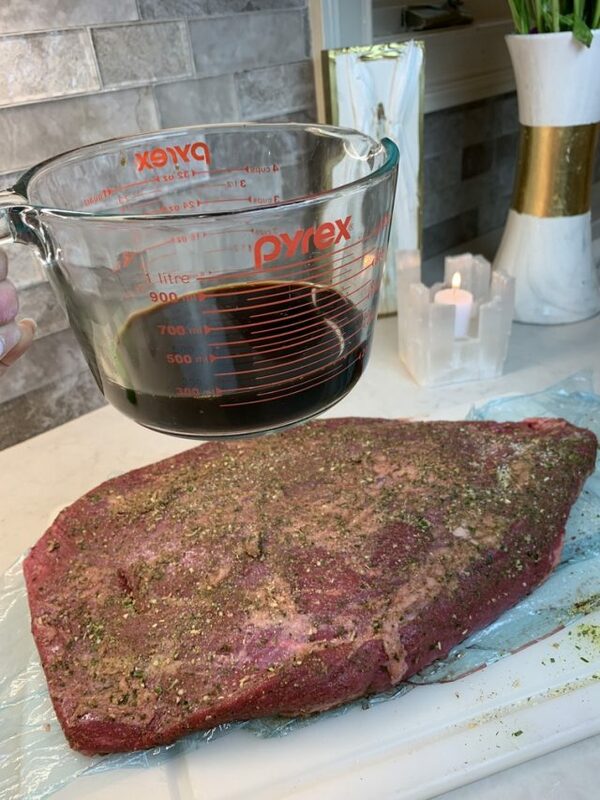 The photos below show how easy it is to marinade a beef brisket for cooking. 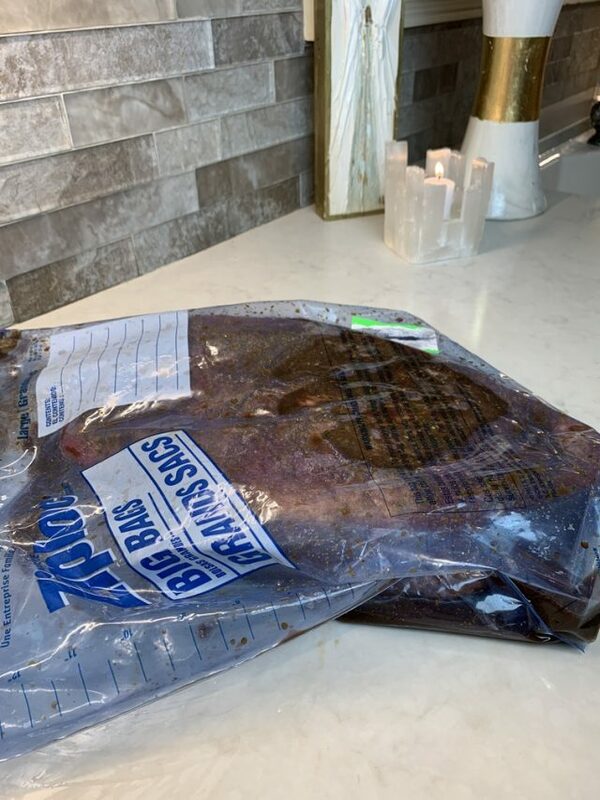 Because a brisket is large, you might need to buy extra large ziplock if you plan to freeze it. 2 gallon will work for small briskets; XL ziplocks work for larger briskets. Rub 3 salts on all sides…. How long do you marinade beef brisket? This brisket needs to marinade 24 hours or overnight. Because I am a “make ahead and freeze” kinda gal, I marinade beef brisket and freeze it a few weeks or months before I plan to cook it. This makes it easier (in my opinion) just before a party, as all you have to do is thaw and cook for the party~the marinade step is done. How does the brisket get a smoked flavor from the oven? Believe it or not, this oven baked brisket has a huge smokey flavor from the marinade. Liquid Smoke (yes, an entire bottle) does the trick. Worcestershire and a 3-salt rub add even more complexity to the flavor. How do you cook a beef brisket in the oven? I place my marinaded brisket in a roasting pan (with the top grid removed). Then, I wrap the brisket tightly with heavy duty aluminum foil. This makes a nice “oven” for the meat~similar to a browning bag. How long do you cook a beef brisket in the oven to make it fall apart tender? For large briskets (4 or more pounds), I put the brisket in super early in the morning so that it will have at least 8 hours in the oven. I’ve also put the brisket in the oven just before bedtime and cooked it all night. Long, low and slow bake time are key to breaking down the meat and making it fork tender. What temperature do you cook a beef brisket to make it fall apart tender? For large briskets (4 or more pounds), I cook them on 300 F for an hour then reduce the oven to 250 F for the rest of the day. This gets the oven going and the heat at a good level before adjusting. How do you prepare/chop beef brisket once it is cooked? Be sure to save the au jus after cooking, as it keeps the meat moist and is great served on the side. I also serve this brisket with white and red barbecue sauces. 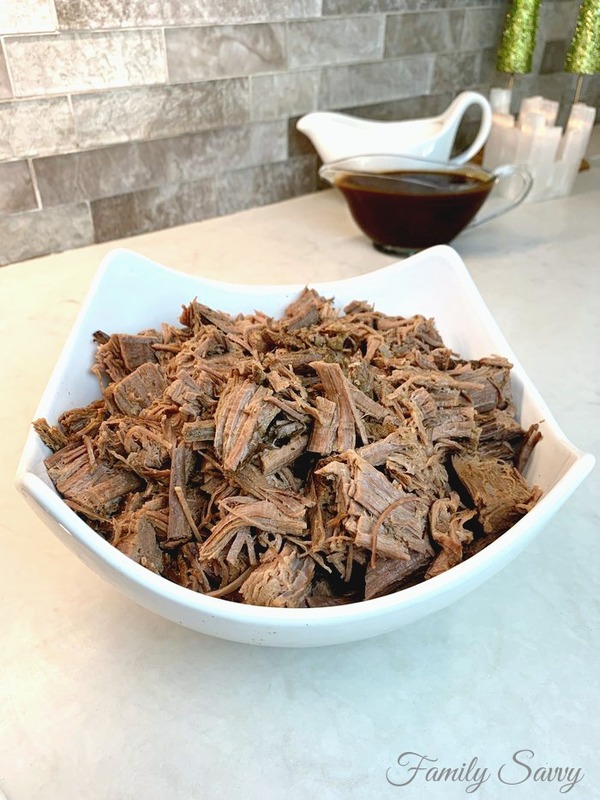 What do you serve with beef brisket? When I make this brisket, I typically serve it with a good slaw. My favorites are this vinegar slaw for BBQ (if I plan to use this for sandwiches), or this crunchy slaw (always a crowd pleaser). For a slam dunk dinner fit for company, I serve this brisket with Boursin Potato Gratin and Shaved Brussels Sprouts Salad with Pecans, Pears & Gorgonzola. These two sides pair especially well with the savory smoky brisket. If you try this, family favorite of mine, please let me know how it turns out! I know your family will love it:-) As always, thanks so much for stopping by. 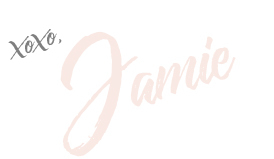 Wishing you a joyful, blessed, and savvy day!!! This is hands down the best brisket you'll ever eat. You'll never make another brisket again! Place brisket on foil or parchment. Rub all sides generously with onion, garlic & celery salts. Place brisket in large tupperware or heavy duty freezer bag (large enough to seal). Pour liquid smoke and Worcestershire over brisket. Seal bag or close tupperware. Marinade overnight, turning occasionally to distribute marinade on all sides. Line rimmed cookie sheet or roasting pan with heavy duty foil. Place brisket down in pan, fat side up. 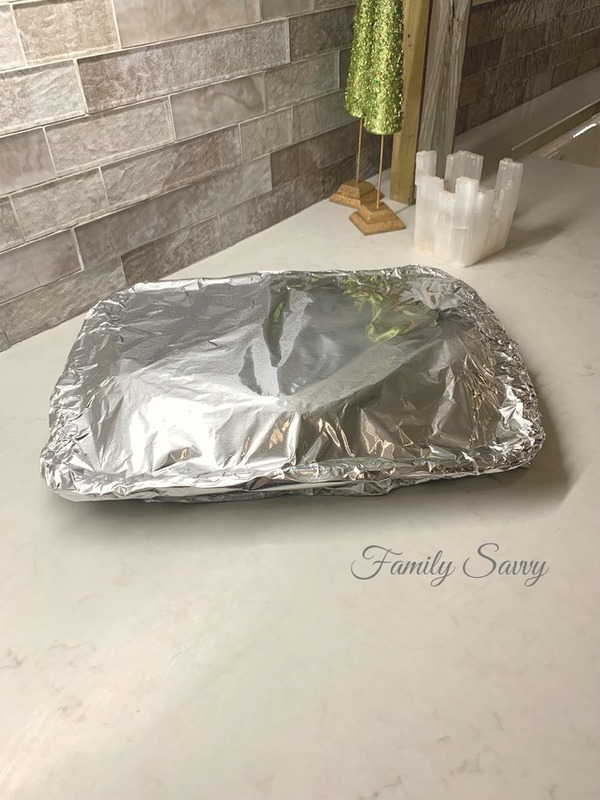 Cover entire pan with heavy duty foil, sealing the edges tightly. Remove from oven CAREFULLY so as not to spill juices from the pan. Allow to sit at least 30 minutes before removing foil. Unwrap foil; scrape fat layer off and discard. Pull brisket into shreds; chop into pieces with kitchen shears. Pour au jus over meat; cover and keep warm until serving. To freeze, make the brisket up to the point of baking, and freeze in the marinade in an airtight freezer bag. Thaw 2-3 days before cooking. Cook as directed. Hey! Great question! You do pour all marinade over, that is one reason you’ll want to make sure your roaster has sides. 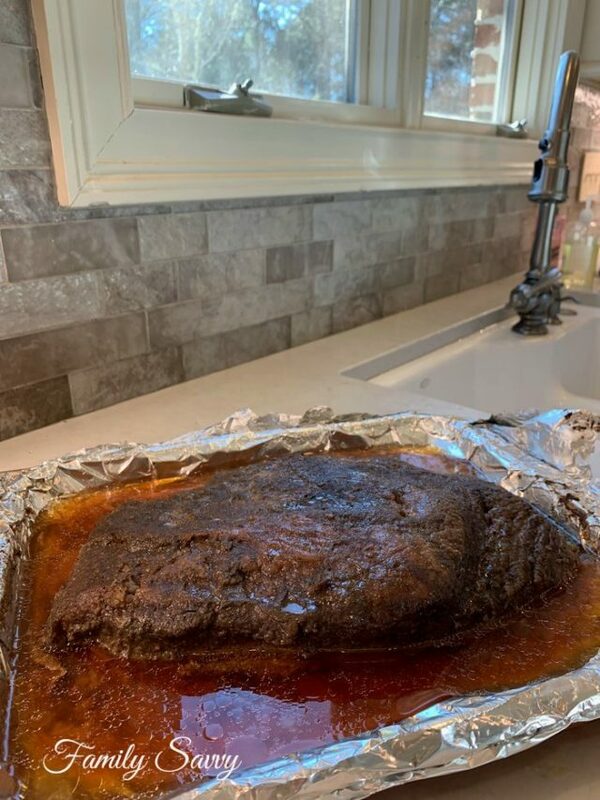 When the brisket cooks, it will release fat, so be careful when removing the finished product from the oven. I’ve had liquid spill out before. Let me know how it turns out! Do you pour the marinade over the brisket in the oven or discard it? Hey girl! Had to check this out! Next time I’m at Costco… I’m so going to get This and cook it:) woo sounds soooo good!